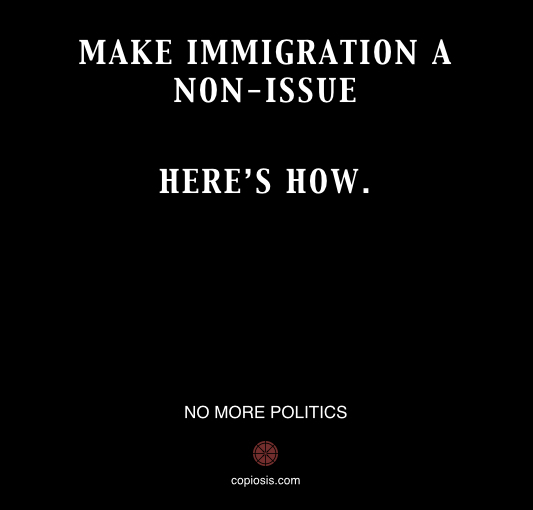 One of today’s political hot buttons is the subject of migration. Those who know United States history know that most positions taken and complaints about migrants are being made by those who also were migrants at one time. What is not recognized is that those complaints and the perceived problems associated with migration are a product of the nature of the money we use. Traditional economies use a form of money which is or represents physical objects. This kind of money has many harmful consequences because it is amoral, it cannot be controlled, it can be taken from you against your will, its supply is independent of the supply of things for sale, and it simulates a zero-sum game relationship which often makes us act as enemies to each other, even within families. It’s easy to see that, because money makes economic interaction seem like a “dog eat dog”, “every man for himself” situation. In that case, any group that we don’t belong to must be working against us. When we see others win economically we feel that they must have won at our expense. So when we see people who don’t look like ourselves or who don’t speak our language or who don’t worship at our church or who don’t eat the same foods or who don’t listen to the same music, we naturally feel that they are our opponents. If they have jobs and you don’t, it must be because they took “your” job. If they have more money than you do, it must be because they cheated in some way. Our form of money causes us to have these feelings even though they are irrational and even harmful. What would the situation be like with a Copiosis economy? Copiosis transactions do not give the impression of a zero-sum game relationship. One can only win in a Copiosis economy if others also win. What benefits others benefits you. So the feeling that those others are your opponents does not occur. If they have money it must be that they are doing good things which provide Net Benefit*. But how can they get money? In our Traditional economy they might be involved in organized crime. In a Copiosis economy there is no organized crime at all. They can’t steal money since Copiosis money is not transferable. If they steal property they would have to smuggle that property out of the nation to some Traditional economy in order to sell it for another kind of money. There simply is no way that they can legitimately gain money without helping others (us) in some way. What about jobs? Wouldn’t those immigrants be taking our jobs? Well, no. They wouldn’t. There is no unemployment in a Copiosis society. Anyone who wants to work to help others may do so. The number of jobs is not limited by the supply of money because the more work that is done the more money comes into existence. What about illegal immigration? Let’s say Michael illegally enters the U.S. In order to get money Michael must have an account with the money computer system. To have such an account Michael must be identified. If Michael attempts to get an account he identifies himself as an illegal immigrant. If Michael does not get an account Michael cannot be paid and Michael must live without money. This means that Michael will be consuming a minimal amount of resources in the U.S. Also, no one is required to help Michael in any way. No one is required to give him food or housing or medical care. Under those conditions, I don’t think Michael will stay very long. Also, no mechanism for enforcement of immigration law is necessary since the situation, the circumstances in which Michael finds himself will take care of him without effort on anyone else’s part. If that weren’t bad enough for Michael, he will be unable to travel except by the free transportation so after he crosses the border it is walk or hitchhike to get almost anywhere beyond the city bus lines. What about legal immigrants sending money that they have earned in the U.S. home? They can’t do that. Money in Copiosis is not transferable. It can’t be given to anyone else. It cannot be sent anywhere to anyone. Money earned here can be spent only here. Of course, the immigrant could buy things and carry them home or send them out of the country. But that’s just like barter. The immigrant is trading work for goods. Nothing wrong with that. What about immigrants coming in just to get the free necessities which are available to everyone in a Copiosis economy? Keep in mind that no one is required to give their property to anyone else. No one has to give anyone else food or clothes or housing or medical treatment. So it will not cost U.S. citizens anything if some citizen wants to feed someone else with their own food. Is it any of your business if your neighbor chooses to give to the poor? Remember that Copiosis economies have no taxes at all. They have no State welfare system. All property is private property owned by individuals. Therefore, if immigrants come for the necessities and no one wants to give them anything then they get nothing. In other words, in Copiosis migration isn’t a problem for U.S. citizens. But let’s consider a worst case situation in which some deranged killer enters the U.S. by crossing the border, somewhere away from the normal entry points. Lacking an account, this maniac would be noticeable since the computer system must be able to identify all persons who have money and all persons who are authorized to credit accounts (two mutually exclusive groups, of course). Therefore, when interacting with anyone in a store or other business, the crazed killer would be identified as an outsider. It would be quite appropriate for any citizen to ask the stranger who he was and what his business was there. As described in the Copiosis criminal justice article, any citizen who helps to prevent crime or enforce the law is paid to do so. Therefore, suspicious actions, such as not being known to the computer system, would tend to generate considerable interest on the part of ordinary citizens. Lacking money, the killer would find travel slow and difficult so getting away would be unlikely. All this makes enforcement of immigration law, even in the worst case, easier and more effective and efficient than is currently possible.